This documentary will trace the final year of King’s life. It was one of the most challenging and controversial chapters of the civil rights leader’s career, yet it has not been the focus of significant public attention. For many, the image of King is of a social and political leader at the height of his powers – especially the period up through 1965. But that’s not the way he was viewed in the last year of his life. This program illuminates the profound personal, psychological and philosophical challenges King faced in his last year. In this time, King tried to gain support for his Poor People’s Campaign, fended off fierce critics inside and outside the civil rights movement, and endured an increasing sense of despair and isolation. 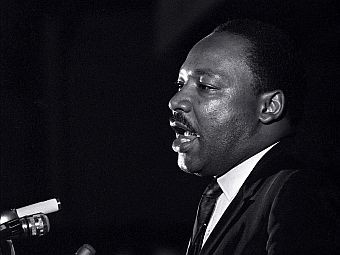 King’s Last March offers listeners a complex view of a man trying to push his philosophy of non-violence to a conclusion many people found more threatening than the dream he described on the steps of the Lincoln Memorial five years before his death.